I try to make an effort to cook recipe-less meals on a regular basis. Some weeks I’ll find myself doing this nightly, other weeks…not so much. But as someone who thinks of herself more as a baker than a cook, it’s important to me to keep experimenting in the kitchen (aside from the baked goods). This particular meal came about when I had absolutely nothing planned to make, and I wasn’t allowing myself to get take-out. Instead, I raided my pantry and freezer, and the result was really quite tasty. There aren’t a lot of pictures, because it didn’t occur to me at first that anyone might be interested in reading about my quick meal. But then I thought, don’t we all want some fast, simple dishes to make during the week? 1. In a large saucepan, heat water over high heat. Add a clove of garlic to the water. 2. In a 3 or 4 quart saute pan, heat olive oil over medium-high heat. Add a clove of garlic to the oil. When oil is just about to smoke, add the shrimp. If you have a cooking screen, you’ll want to use it (especially if the shrimp are frozen). Cook for about a minute on each side, and remove the shrimp to a bowl and discard the garlic clove. Season the shrimp with a little salt and pepper. 3. When water comes to a boil, add a little oil (it keeps the foam that develops on top of the water to a minimum when cooking pasta) and a generous amount of salt. Add the linguine and set the timer for 9 minutes. 4. Add the diced tomatoes and about 4 sprigs of thyme to the saute pan. Season with a little salt, pepper, and red pepper flakes (for just a little heat). Mince the remaining 4 cloves of garlic and add to the tomatoes, cook until garlic is fragrant. Add a small amount of white wine (about 2-3 oz) to the tomato mixture. 5. Chop a handful of parsley, add about 2 tablespoons to the pan, reserve just enough for garnish. Squeeze the juice of 1 lemon into the tomato mixture, remove the pan from the heat. Add the shrimp to the pan, and the linguine. Give the mixture a good stir and cover for about five minutes to let the linguine finish cooking and the flavors to blend. Remove the thyme sprigs before serving. Garnish with parsley and shredded parmesan. Serve with the same wine you cooked with. *If you have any leftover protein, such as chicken, you can certainly substitute that for the shrimp. I love hearing about quick meals, since I never have time on weeknights to put something elaborate together. 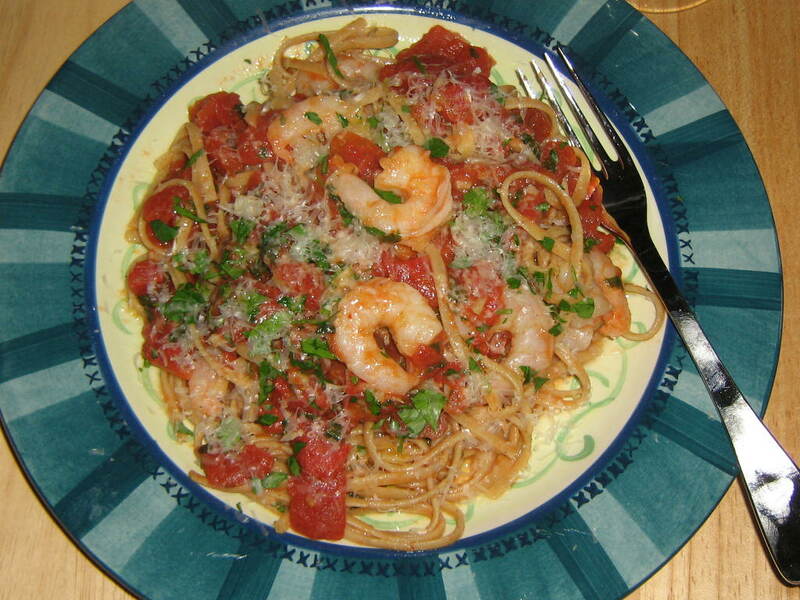 This looks really good, I have a bag of shrimp in the freezer that I need to use up.